This year's Alumni Dance will be Saturday, April 26th with a free Cha Cha lesson at 7 pm and social dancing from 8 pm to 10:30 pm. The night will include performances by BPG, as well as a guest appearance by DanceFX’s CONTACT Ballroom Dance Company. 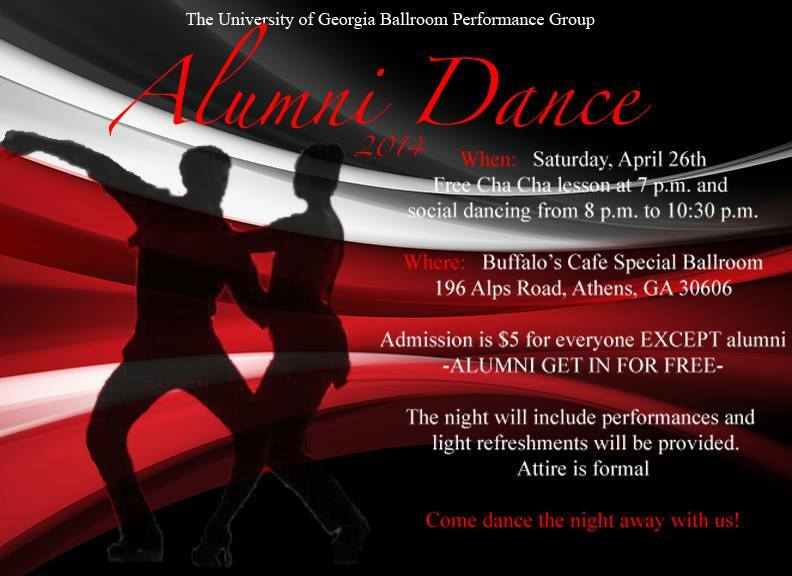 The dance will be located at the Buffalo's Cafe special ballroom at 196 Alps Road, Athens GA, 30606. Dress attire is formal and light refreshments will be provided. Admission is $5 for everyone except alumni - you get in for free! Come dance the night away! We can’t wait to see you!